Had heard of this small tiny book long back, and I recently stumbled on it again on my bookshelf on the iPad. Right time I thought, as I was looking for something light and quick to read. This deceptive book is none of it. In spite of the small volume of the book, and a seemingly simple story, it takes you on a thinking spree and gets you completely in a reflective frame of mind. The book starts with a gathering of several former classmates, and their conversation leads them to work and relationships. Everyone seemed to be coping with the changes that were unexpectedly happening over the recent years. Most of them admit that they do not know how to handle this, and this is when the author recites them a short story. The story is about two mice – sniff and scurry, and two little men – Hem and Haw, and their search for cheese. Initially they feast on what seems like a never ending station of cheese and they settle in, growing fat and lazy. One fine day the Cheese station becomes empty and the cheese is all gone. This is where the mice decide to put on their running shoes and start scouting for new cheese. Hem and Haw, on the other hand, sulk around the maze. In the end, Haw discovers an even bigger Cheese station and this time he is wise. He enjoys the cheese at this new station, but still keeps his running shoes ready for the time he might have to enter the maze again. The mice and the little men, in spite of the differences in their brain processing powers, woke up everyday searching for new Cheese. The mice did this immediately and the little men, using their complex brains, took some time to realize this reality – Change happens. The book continues with the room full of former classmates now reflecting on the story and draw parallelisms to the change in their own lives. 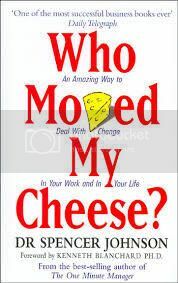 Cheese here is the metaphor for everything we want in life – good job, loving relationship, money, health, peace, etc.. The reality of life, very well explained through the simple story, is the fact that the cheese would keep moving and the sooner we adapt to the new environment, the higher the chances of attaining our goals.